Smith established himself as a highly productive ground gainer when, in his first college start as a freshman, he rushed for 224 yards against Alabama. He went on to gain a school-record 3928 yards in three seasons at Florida before entering the 1990 NFL draft following his junior year and was taken by the Cowboys in the first round (17th overall). Cowboys went 7-9 to finish fourth in the NFC East. Smith followed up in 1991 by leading the league with 365 carries for 1563 yards and earned a second trip to the Pro Bowl. He was a consensus first-team All-NFL selection in ’92 as he again topped the NFL with 1713 yards and scored a total of 19 touchdowns and the Cowboys won the Super Bowl. Smith led the NFL in rushing for a third straight year in 1993 (1486 yards) as the Cowboys repeated as league champions, and he again received MVP recognition. He led the NFL once more in rushing (1773 yards in 1995) in the process of gaining over a thousand yards in 11 straight seasons. Smith also led the league in touchdowns scored on three occasions, including a then-record 25 in 1995. He was a consensus first-team All-Pro four times and was selected to eight Pro Bowls. 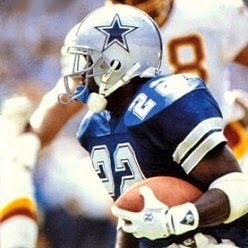 Smith became the NFL’s all-time leading rusher while still with Dallas before finishing up with two seasons in Arizona. He ended up with 18,355 yards on the ground (17,162 of them with the Cowboys) and scored a total of 175 TDs. He was inducted into the Pro Football Hall of Fame, Class of 2010.